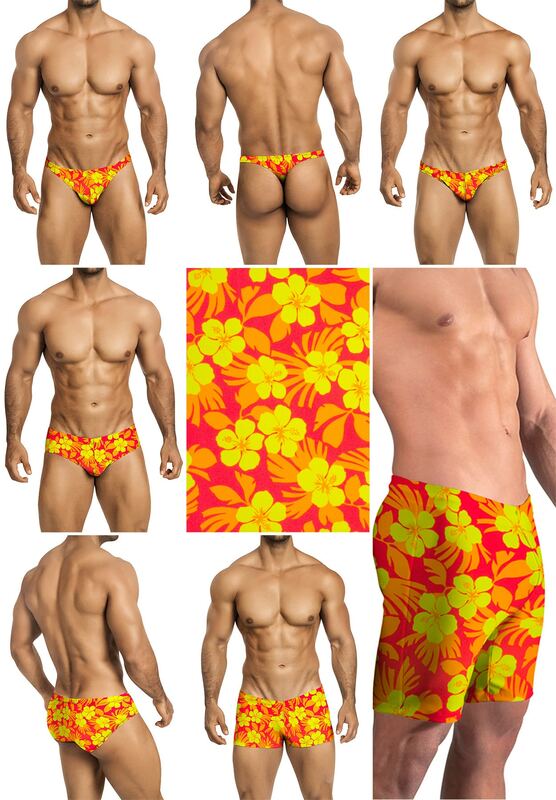 Here's a print that really commands attention at the beach or at the pool. A brilliant neon orange is splattered with tropical hibiscus in bright yellow. If you don't want to take a chance on the suit being too revealing, especially when wet, a front lining is available for $5 to give you peace of mind. All 5 styles are unlined (unless you choose lining option), without messy drawstrings. Elastic waistband. All styles come with a roomy and comfy front pouch that holds and accentuates a man's natural assets. Please be aware there's a seam down the center front that sometimes doesn't show in the product photos. Also, as with any print, the pattern falls randomly as the fabric is cut, so your item will look very close, but not 100% identical, to our photos.